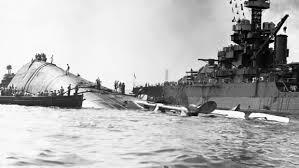 Tennessee Governor Bill Haslam has declared Friday as a day of mourning after the remains of an Elizabethton sailor…killed in the attack on Pearl Harbor in 1941 have been identified and will now be laid to rest. U.S. Navy Seaman 2nd Class William Campbell’s remains were identified in May by DNA analysis. And now, Campbell will be laid to rest, however the family has decided not to release the details of the arrangements. Campbell was twenty years old when he was killed along with 429 others in that attack.